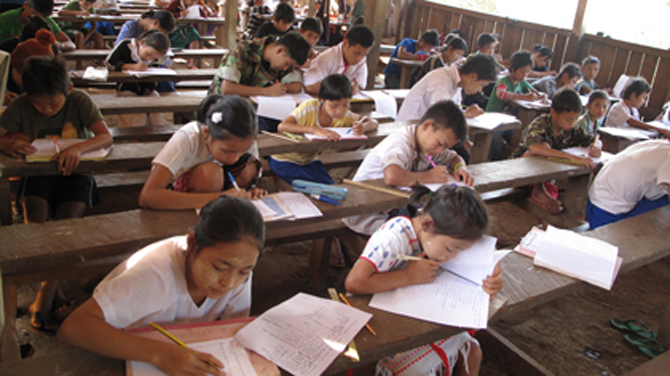 Caught in the crossfire for decades, thousands of ethnic children in the conflict zones of eastern and southern Burma are forced to live in temporary shelters and refugee camps without the chance of receiving a formal education or going to university. A young ethnic Karen refugee, Chi Doh, said he ended up receiving just 700 baht (US $23) a month salary teaching at a community-based school in a refugee camp as he has no other options. The 21-year-old told The Irrawaddy that he had no opportunity of going to a college or university after he graduated from a post-ten school in Mae La Oon refugee camp. Like Chi Doh, there are thousands of young people spread across nine refugee camps on the Thai-Burmese border. Some are displaced from eastern Burma due to civil wars and attacks by the Burmese government army and have no chance to going to school. “As education is very important, it is risky for these children when they are deprived of formal schooling,” said Chi Doh. Some of them leave the refugee camps after graduation to seek a job in the towns and cities of Thailand. But due to their illegal status, many get arrested by the Thai police. They must offer bribes to be released as camp inhabitants are officially banned from traveling to seek work elsewhere. Due to these harsh restrictions, many refugees apply for resettlement in a third country under the assistance program of the United Nations High Commissioner for Refugees and Thai authorities. Since 2006, more than 70,000 refugees have been resettled in third countries including the United States, Australia, Canada, United Kingdom, New Zealand, Japan and other European Union countries, according to statistics by the Bangkok-based Thailand Burma Border Consortium (TBBC), a humanitarian agency providing aid to the refugees. Bway Gay Thein Maung, the head of the education department in Mae La Oon refugee camp, said despite many young people receiving some sort of education from community classes, they still do not have the chance to go to university afterwards as their informal high school certificates are not recognized by international institutions or colleges. After studying in refugee camps, many young people end up as community staffers who work in non-governmental organizations (NGOs) with extremely low wages—earning 700 to 2,000 baht ($23 to $65) per month. Some work as schoolteachers, others are health workers while a few become leaders of community-based organizations. Some, however, get involved in underage marriages while many leave the refugee camps to find work as casual labor in third countries. However, there remains a minority of students who continue their education in universities in Thailand with the assistance of NGOs. However, they must first obtain legal documents to do so. Some continue formal education after resettling in third countries, but must first pass a test to study in local community colleges. They can then only go to university only if they successfully finish these courses, said Bway Gay. However, resettled refugees claim that many young people in third countries are not able to continue formal education as they have to work long hours in order to earn a living. Naw Nyone, a Burmese refugee who resettled in Minnesota, United States, in early 2011, told The Irrawaddy that she could not keep up her studies as she has to work in a factory to survive. She earns between $80 and $100 per day. At first the 20-year-old thought she would continue her education in the US and become a prominent politician as she had dreamt of as a child. When she stayed in Mae La Oo refugee camp, she was enthusiastic and read many books about the politics of Burma. Saw Eh Doh Wah, the head of media and advocacy at the Karen Teachers Working Group, a non-profit organization in northern Thailand, said that very few qualified children in refugee camps received scholarships given by the Open Society Institute with the assistance of the Zionist Organization of America NGO. They, however, have to sit TOEFL tests and obtain legal documents such as passports in order to get access into a university. Observers have said that armed conflicts between government troops and ethnic rebels remain the main reason why thousands of ethnic minorities have been displaced for decades, leaving young people suffering a lack of education. There are an estimated 450,000 internally displaced civilians currently in eastern and southeastern Burma due to civil wars, according to a TBBC report. Children and young people make up the majority of the displaced. Under the rule of guns and bullets, education is eradicated. Than Shwe has no education and education has no value to him. The current government is ten percent democratic, ninety percent dictatorship. Since this government is spending too much budget for military, Education and Health Care have to suffer years to come. It is so sad. It is very sad that Karen students in Thailand do not have the opportunity to attend university. Here is Australia, where there is government suport for college and university students, newly arrived Karen students are sucessfully studying in university. I know one Karen Buddhist monk who has almost completed a Master degree in social work, while other Karen students are completing degrees in law and education. Karen students will succeed if they have the chance.